System Name - The system name of the Block. There is no functional requirement for a type letter in the System Name of a Block, but by convention we use 'B' for 'Block'. The default implementation is not system-specific, so a system letter of 'I' is appropriate. This leads to system names like "IB201". User Name - The user name of the Block. The user name of a Block created here may be set to any text. The user name for a Block created by Layout Editor is set by Layout Editor and should not be changed. Comment - You may enter any text in this field that will help you distinguish this Block from other Blocks, or provide useful notes about its use. Sensor Select the Sensor from the drop down list that will be associated with this Block. You can edit the Sensor Debounce options from this tab; setting the Sensor Debounce helps to prevent false triggers of a Sensor being passed into the system and triggering other events in the system. Such false triggers could be due to a dirty piece of track or electrical interference. The Use Global Debounce Values check box, allows you to select if the sensor will use the default sensor debounce values if configured. Inactive Delay and Active Delay allow you to specify the amount of time in milliseconds that the system waits before registering the state change of a sensor. Reporter Set the Reporter assigned to this Block. See the Reporter Table. Selecting a Reporter and clicking Apply puts the Reporter Value into the Block value. The first two are from the CurrentReport; the last two from LastReport. At start-up (assuming there is nothing within the range of the reader), both 2 and 4 are the initial state. Once something is seen, both 1 and 3 return the same result. When the something is 'out-of-range' 2 and 3 are then active. With 'Use Current' selected the Block value will switch between 1 and 2, whereas with 'Use Current' unselected the Block value will switch between 3 and 4. Describe the geometry of the Block using the fields shown. Length (optional) - Displays the length of the Block. Optionally, you may enter the length of the Block here. The length is used for automatic running of trains. If '0.0' is displayed, the length has not been entered. The entered length should be the actual length of the Block on the model railroad layout. Length is entered and displayed in either inches or centimeters, depending on which unit is next in the Block Table. Curvature (optional) - Displays the curvature selected for the track in the Block. Curvature is used for automatic running of trains, and need not be entered if trains will not be run automatically. Curvature, if present, indicates to the computer that it should slow the train as it runs through the Block. If None or Gradual are selected, an automatic train will proceed at normal speed. Tight should be selected if the train should slow down some; Severe should be selected if the train should slow by a maximum amount. If the Block has variable curvature, your selection should be made according to the most limiting part of the Block. Speed - The speed is used with certain automation tools and logic, to help determine the speed at which a train can be set through the block. It is also used by the Signal Mast Logic for determining which Aspect should be displayed in a signal path. In the drop down list, you are presented a set of named fixed speeds that have been predefined in the signalSpeed.xml file, in addition to a global option. It is also possible to enter a numerical value to represent a speed. 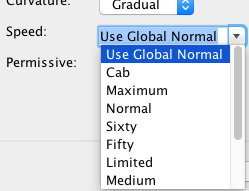 The global value is set via the Speeds menu option. Permissive - The Permissive option is used to identify Blocks that can be entered by another Train while it is already occupied. This option is used with certain automation tools and Logix to help determine if a Train can enter an occupied Block and what Aspect should be displayed on its Signal Mast. Back to the Block Table Help page.